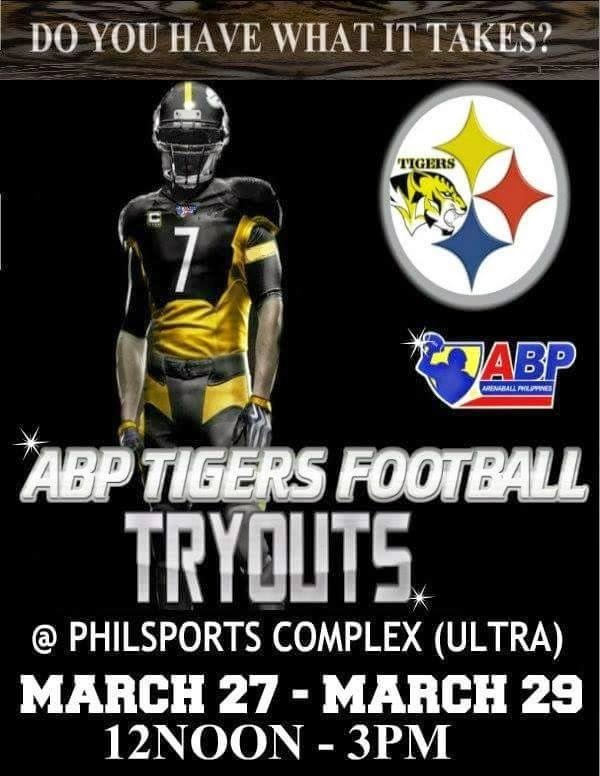 ABP Tigers Football will hold a tryout to be held at the Philsports Complex (formerly Ultra Gym) in Pasig City on March 27-29, 2015 from 12nn to 3pm. 1. Get your body in peak physical shape. Football coaches at a tryout will try to break you down to see which players have the endurance to be successful. Entering a tryout in top shape will be an immense help. Focus on endurance running, sprints and muscle strengthening for the arms, legs and core. 2. Practice the skills specific to your position. Tryouts give you a short period of time to impress coaches. Any shortcomings will be easily spotted. For example, quarterbacks should practice accuracy and reading defenses by working with receivers. Running backs should hone their ball security and catching out of the backfield. Defensive linemen should improve getting off the line and shedding blockers. Work with previous coaches and teammates if available. 3. Study film, if available, Watching games of football teams will let you see what type of system the teams run. If you know what teams are looking for from each position, you have a better chance of impressing coaches. For example, a tight end may notice on film that a team frequently calls for the player in that position to stay on the line to provide pass protection. This allows the tight end to practice pass blocking and exhibit these skills at a tryout. 4. Talk to coaches from the team about what will be expected from you at a tryout. A coach can also tell you what positions or attributes the team is looking for. A player who played wide receiver and cornerback on previous teams may learn that the team is looking specifically for receivers. He can concentrate on this position and the traits that go along with it. 5. Gather all the materials needed for the tryout. The team will have a different set of items that you need to bring. These may include a tryout registration form in which you provide information about your measurements and experience. Additionally, appropriate gear, such as cleats and workout clothing, should be brought. Check with the team or coaching staff to see what the team needs from you.